I went looking around for a kitten for my family and I found a white kitten for free. The kitten in the pic I saw was sleeping on his back. All I saw was white fur and pink nose and paws. Thinking it was just a plain cat my son and I drove 30 minutes to get him. When we got there I was surprised to see the orange on him. We took him home and got a real good look. His face was shaped like a Siamese! At this time I never heard of a Flame point Siamese, so I thought he might be a cross breed. I got curious and found this site. Wow! What a discovery! He is so good to my two year old son and can't get petted enough. I must say I am a lucky owner of a wonderful cat! We've had quite a number of Flame point Siamese photos sent in over the years - the orange gene that helps to create the Flame point coloring must be a strong one. Mischief is a wonderful name for a Siamese cat! We got a flame point cat from a rescue shelter for my son for Christmas. He has made a wonderful addition to our family. Mild mannered, loveable, socialable and attached to every one in our family. He even plays with the dog. We are so glad we found him. My buddy, Smokey died last summer. She was a domestic shorthair, only 19 years old. For Mother's Day this year my sweet husband suggested that I go to our local animal shelter to find a new cat. Bella was there waiting for me. I had no idea that she was any kind of Siamese, She was so approachable and purred like a motor. After anxiously waiting five days to determine if her mother was looking for her, I brought Bella home. At the shelter I was informed of her true pedigree. What they failed to tell me is that I now have the smartest, gentlest, most loving, cuddly cat I have ever owned. I would recommend a Siamese like my sweetheart,Bella to anyone. She is as lovely on the inside as she is on the outside. Nine months old, her color is still changing, she is a joy. Having a buddy, she follows me around the house and when I phone during my planning period to speak to my stay at home Dad, my husband states that when she hears my voice, she starts to rub on the phone and purr so loudly that I can hear her. I had a cat that looks exactly like Mischief. I loved that cat so much. He recently died. I was hoping to find me another. I just found out that my ten year old cat, Tommy, is a Flame Point Siamese. I came across a picture of one and thought, wow, that looks just like him. It also explains a lot about his incessant meowing, demanding behavior, royal disposition, and stunning blue eyes. He is smart (survived 9 years as an outside cat near a major highway) and very loving. I'm grateful to have him live the rest of his life as an inside kitty in a warm and safe home. What a joy it was to have my yellow tail Siamese. Almost human, very loving cat. I found him in the sleigh cutter in the barn and was abandoned by his mother. I nursed him and raised him up like a child of my own. He was seven years old when, sadly in 2011 he was diagnosed with severe cancer. We lost him, and my heart aches for him every day. I have other cats, but he had a special bond with me. I loved him so much. My mother died in 2009, and he got me through the loss I felt. I know he is sitting on my mother's lap, waiting for me. Some day we will all see each other, my little angel wing. 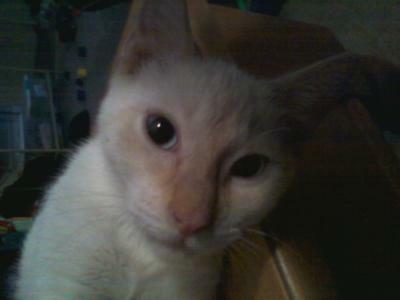 I adopted Snowy, my beautiful flame point Siamese from the Animal Humane Society two years ago. He is the most wonderful cat I've ever owned. He's smart, affectionate, and very very very vocal. These cats are so special and they brighten the lives of everyone they meet. I love my Flame Point like my son! My flame point's name is Fred. He's like a person to me, he's like no other cat I have ever had. He sits on my shoulder all day. I also love his pink nose and blue eyes. I could not live without him. Hi. I live in the UK, and got two old cats from the RSPCA after my other one died. Then I found under a hedge a very badly hurt white cat, I thought perhaps he had been hit by a car but as I live rural, nobody I knew owned this cat. After taking care of him for a few months and his wounds healing I saw he was beautiful, he had the bluest eyes I had ever seen, a cream coat and a ginger ringed tail. I thought his parents were white/ginger - then watching an American TV show called Emergency Vets, the man on there had Winston's double and was told it was a Flame Point Siamese. Over here they are called red tip Siamese [red point Siamese - ed.] He is the most loving cat I have ever had and he just loves my two other cats and dog. Nobody has ever come forward to claim him and I have tried to find out for a year now. He will stay here with us, we love him so much and he loves my Grandson too. I too have always wanted a white cat. So when my daughter in law said her black and orange cat had a solid white kitten I told her within the first week I wanted it. She found out it was a male and I said I still want it, and go ahead and name him Casper. Well, when I first got him I noticed he had a touch of yellow on the end of his tail and lightly on his ears. Then as time went on his face started turning like he had on a mask and his ears are yellow and his tail is yellow and white striped. Come to find out he was a flame point Siamese. I have a full blooded Siamese cat that is almost 14 years old. I got noticing that he was starting to have her features more and more. She (Buffy) is a Seal Point. She is the love of my life. I must say that Casper has become a joy to our house though. He is so full of energy and has his moments where he is full of himself and then he will just turn into a big ham and want all the love in the world. The 14 year old love of my life (short-haired mutt cat) died from a thyroidectomy surgery in December, and my daughter thought she would bring me a cat home she found on the internet for free. She told me it was a runt and knew nothing more about it, and then I brought it to the vet where my cat had the surgery. My vet said they would take care of all the shots and luke and flea and spaying for free, and that's when I found out what kind of cat I had. Everybody was making such a big fuss about her. Then a lady just so happened to have had an adult male in the office, and it was so big it was like a bob cat Sphinx, it was huge and I said if my cat gets like that I'll love it to death. But I think my cat will be a Princess Bella, not a king of the forest.